Mittelman Observatory and Middlebury Physics will again host stargazing open house nights this autumn. These Observatory events are scheduled for Friday evenings, September 14 and September 21, from 8:30 PM until 10:00 PM, weather permitting. Observatory open house nights are free and open to the public. However, these events will take place only if the sky is expected to be mostly clear. Please check the Observatory web site at go/observatory or call the Observatory at 443-2266 after 6:30 PM on the evening of the event for weather status. This entry was posted in Midd Blogosphere and tagged astronomy, Midd News & Events, Midd Points, Observatory, physics, science on September 5, 2018 by Jonathan Kemp. Mittelman Observatory and Middlebury Physics will again host stargazing open house nights this summer. These Observatory events are scheduled for Wednesday evenings, June 27, July 18, July 25, August 1, and August 8, from 9:00 PM until 10:30 PM, weather permitting. Observatory open house nights are free and open to the public. As these are minimal language events, they are also appropriate for Language Schools students. These events will take place only if the sky is expected to be mostly clear. Please check the Observatory web site at go/observatory or call the Observatory at 443-2266 after 7 PM on the evening of the event for weather status. Please also consider taking a moment to view our new David Mittelman Astrophotography web site and our new Mittelman Observatory Weather Station web site. This entry was posted in Midd Blogosphere and tagged astronomy, Midd News & Events, Midd Points, Observatory, physics, science on June 13, 2018 by Jonathan Kemp. Mittelman Observatory and Middlebury Physics will again host stargazing open house nights this spring. These Observatory events are scheduled for Friday evenings, April 27 and May 4, from 9:00 PM until 10:30 PM, weather permitting. 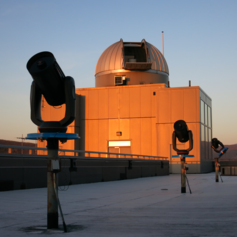 Observatory open house nights are free and open to the public. However, these events will take place only if the sky is expected to be mostly clear. Please check the Observatory web site at go/observatory or call the Observatory at 443-2266 after 7 PM on the evening of the event for weather status. This entry was posted in Midd Blogosphere and tagged astronomy, Midd News & Events, Midd Points, Observatory, physics, science on April 19, 2018 by Jonathan Kemp. The Mittelman Observatory and Middlebury Physics will again host stargazing open house nights this autumn. These Observatory events are scheduled for Friday evenings, September 15, September 22, and October 6, from 8:00 PM until 9:30 PM, weather permitting. Observatory open house nights are free and open to the public. However, these events will take place only if the sky is expected to be mostly clear. Please check the Observatory web site at go/observatory or call the Observatory at 443-2266 after 6 PM on the evening of the event for weather status. This entry was posted in Midd Blogosphere and tagged astronomy, Midd News & Events, Midd Points, Observatory, physics, science on September 6, 2017 by Jonathan Kemp. The Mittelman Observatory and Middlebury Physics will again host stargazing open house nights this summer. These Observatory events are scheduled for Wednesday evenings, July 5, July 19, July 26, and August 2 from 9:00 PM until 10:30 PM, weather permitting. This entry was posted in Midd Blogosphere and tagged astronomy, Midd News & Events, Midd Points, Observatory, physics, science on June 27, 2017 by Jonathan Kemp.